4 season sleeping bag, cold weather walking clothes, 3 season hiking boots, flip flops, head torch, water bottles, iodine, snacks. If like me, you prefer to get off the beaten track when trekking, you'll likely find that Naar-Phu is both rewarding and frustrating in near equal measures. Since the approach and exit follow the Annapurna circuit (appropriately nicknamed the Annapurna circus), it is impossible to avoid the marauding masses on this trek. However, once you do get off the circuit and into the Naar-Phu Valley, the crowds evaporate and the beauty and tranquillity of this Tibet-esque region will blow you away. Don't get me wrong, there's lots to enjoy on the Annapurna circus especially if you take some side trips off the main route, but inevitably, as tourism has boomed, so has the development and the consequential environmental damage. An unpaved road is pushing further and further up the Marsyangdi River valley and on the Kali Gandaki side it has already reached Muktinath. While it would be selfish to expect the Nepalese to forego modernisation to preserve a nostalgic western image of Himalayan life, it is sad to see it go none the less. My advice would be to go soon before the old fashioned charm disappears for good. While the Annapurna circus is technically easy and can be done without the support of guides and porters, the remoteness and terrain of the Naar-Phu valley make it more of a challenge and inexperienced trekkers should consider taking a guide. Since the region is restricted and should only be visited by organised treks, trekking independently isn't really supposed to be an option. However, some agencies will, for an additional fee, purchase the permit on your behalf on the pretence of you joining a party which means you can enjoy the area without the expense and annoyance of being in an organised group. I used Green Horizon Tours who were excellent. If opting to go it alone, you need to be fit and confident of your abilities and the ability to speak some Nepali or Tibetan is useful as little English is spoken in the villages. Navigation is rarely a problem but care needs to be taken to properly acclimatise to avoid acute mountain sickness (AMS), especially when crossing the Kang La (5306m) and Thorung La (5416m). This description is based on my personal experience of trekking in October 2008 and is not intended to be an authoritative guide. Conditions on the trail may have changed and I advise anyone wanting to make the trek to consult a professional trekking agency before setting off. You will need to do this anyway since you need an agent to buy the permit. Some of my trekking days are very long and you may wish to reduce some of them depending on your fitness and schedule. There are no other permanent settlements on the trail after Koto other than Naar and Phu but there is a seasonal settlement at Meta (half way between Koto and Phu), plus some seasonal settlements and GoTh (animal shelters) that can be slept in if you don't mind roughing it. Meta is only open in high trekking season (Oct-Nov) so if coming during low season, come prepared for camping or sleeping rough. This trek could be combined with the Manaslu circuit (also restricted) to make it a more challenging (and expensive) epic or if you are short on time or want to avoid the Kali Gandaki section, you can fly from Jomosom to Pokhara, or you can simply return the same way back to Besi Sahar. A more challenging alternative to the Thorung La would be the crossing at Tilicho Lake to the south of Thorung. 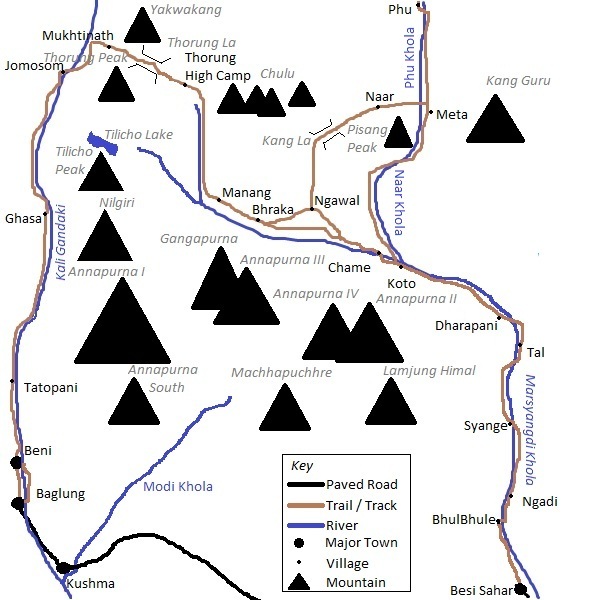 Originally, I had planned to take this route and cross from Tilicho Base Camp Lodge (the new lodge above Khangsar) to Jomosom in 2 days with a night camping at the lake. However, after my trekking partner, Richard Durham, was medevacked on the third day with a suspected fractured ankle, I had to abandon the idea and went over the Thorung La instead. Richard and I arrived in Kathmandu on a Sunday and spent the Monday hanging out while Green Horizon Tours sorted out our trekking permits. The Immigration Department needed the passports to issue the permits so it couldn't have been organised in advance unfortunately. The immigration office is also only open on weekdays which is worth bearing in mind when planning your own trip. We used the spare day to buy food supplies, do some sight-seeing and visit some old friends. My Baglung family (see Living and Working) now live in Kathmandu so I swung by their house to say namaste. Incredibly, we were up at 6am for the 8am bus despite a second late night in Tom and Jerry's bar. The bus to Besi Sahar departs from Gangabu on the north Kathmandu ring road, a 20 minute taxi ride from Thamel. The bus stop and ticket booth is 1km east of Balaju bus park on the right hand side of the road (going clockwise). It isn't obvious but the taxis know where it is. While waiting for the bus, we filled up our fuel containers at a nearby petrol pump for the stove we would never use. After an unexplained 45 minute delay, our rather cramped "micro" bus started off the 6 hour journey at a painfully slow pace while it touted for more business around the ring road. Once on the Prithvi highway, it got going and didn't stop again for 3 hours until it was daal bhaat time. After Dumre, the narrower Besi Sahar road turns right off the Prithvi Highway and the white knuckle ride begins. After a few near misses with other buses and a lot of stopping for local fares, the bus rolled into Besi Sahar at 14:45. We got off at the last stop at the far end of town and were immediately jumped on by jeep touts. The jeep took 1.5 hours to travel the 10km to Bhulbhule where the drivable track ended, although it was debatable whether any of it was drivable in my opinion. The jeeps are crammed to inhuman conditions with about a dozen people inside and 2 or 3 more on top of the bags on the roof. It's probably only 2 hours longer to walk it, which in retrospect would have been a small time sacrifice for the increased comfort and safety. We got our trekking permits checked at Bhulbhule and immediately started on the trail below the office. After an hour we reached Ngadi just as dusk fell. We stayed at the Kamala Lodge at the far end of the bazaar where we had some tasty raksi (local millet spirit) and daal bhaat for dinner. We hit the sack at 9pm. I woke up before dawn to the sound of cockerels and dogs and got up just after 5am to pack. We left the lodge at 6am after a cup of tea and were 10 minutes into the walk when I thought I'd left my camera behind and ran back for it. It wasn't at the lodge but was packed inside my rucksack all along! Once back on the trail we made quick time and after a steep climb, reached Bahundanda in 1¾ hours. Although there were no mountain views, the scenery along the trail was stunning none the less and typical of the low hill with katus-chilaune forest and terraces of lush green rice paddy (khet) carved into the hillsides. After breakfast we pressed onto Syange in 2 hours where we stopped for daal bhaat and an hour's rest at the Sonam Lodge. From Syange, it was a long, hot climb around a landslide to Jagat (1½ hours) after which the path went back down to the river and ascended again to Chamje (1 hour). Frustratingly, the path then descended again to the river, crossed on a suspension bridge and ascended again to Sattale. By now the scenery had changed from the lowland rice to dry terraces (bari) of millet (kodo) and maize (makai). After contouring for a while, the path descended to Tal Phedi and then climbed steeply beside the roaring Marsyangdi which crashes its way through huge boulders. From the top, Tal could be seen beside the river where the valley bottom had widened and flattened between the cliffs. The path descended again to the river and used to follow the base of a large cliff beside the river to Tal. Unfortunately this section had been washed away and a steep, upper path had been constructed over the top. Rather than face any more climbing, we teamed up with an English couple, Dave and Cath, whose guide had seen children wading through the river where the old path used to be. Right enough, a line of rocks and branches had been built up just above the waterline with only a few gaps requiring wading (knee-depth only). We changed into flip flops and gingerly picked our way around the cliff beside the very fast flowing Marsyangdi. Too lazy to change back into boots, we flip flopped the final easy minutes and arrived into Tal 2½ hours after Chamje. We followed the guide to the Peaceful Guesthouse which had a spacious dining room, hot shower and excellent daal bhaat which we ate with chicken curry that had not long before been a hen happily scratching around the yard. We were completely shattered after the long walk and turned in again at 9pm. The plan today was to reach Koto at the start of the Naar-Phu valley which would have been another full day on the trail. However, circumstances dictated otherwise when Richard seriously injured his ankle and called an abrupt end to his trek only 2 hours into the day. It had started off well enough even though we had woken late at 6am still tired and stiff from the previous day's epic. We got on the trail at 7:20 and pushed through the stiffness to reach Kkotro in just over an hour where we stopped for breakfast. We moving well and were making good time to the next village of Dharapani, which I foolishly remarked out loud to Richard. At which point his foot slipped sideways off a protruding rock and he went down to the ground with a cry of pain. After the initial pain had subsided, he managed to get back on his feet and was able to hobble the last 15 minutes into Dharapani. On the way, the peak of Manaslu became visible up the Dudh Khola valley although it was hard to get too excited about it. We stopped at the check post where Richard took off his boot to reveal a swollen ankle the size of a grapefruit. We knew immediately that he was going no further and we'd need to stop here and arrange some kind of evacuation. We checked into the Tibetan Lodge and spent the afternoon making phone calls to Govinda at the agency and to the insurance company back in the UK. A helicopter was arranged at a cost of US$1,500 per hour which would arrive the next morning from Kathmandu. The hotel owner had been very helpful and had also booked us a helicopter so we had 2 coming at one point until we realised this and cancelled one. We discussed whether I would return on the helicopter with Richard but he insisted I should go on. We agreed I would to go on to Naar-Phu as it was so close and then we would meet up in Pokhara in 8 days time. This meant I'd need to trek quickly and bring forward the flight out of Jomosom. Richard said he'd go to Chitwan for a safari after taking a few days rest in Kathmandu. I realised that the plan to cross the mountains at Tilicho Lake was too risky to do alone and the camping equipment we were sharing between us would have been too heavy for me to have carried by myself. We donated the food and petrol to the hotel and I gave Richard the tent, stove and other surplus items to take back on the helicopter. I did try to explain to the hotel sauji that petrol wasn't the same as kerosene and couldn't be used in the local stoves. I do hope he understood. We ate a delicious daal bhaat at the hotel and both retired to bed feeling rather depressed. We got up at 6:30 and had breakfast before wandering (limping in Richard's case) slowly down to the school where the helicopter would land. We had been told it was leaving at 7am so expected it to land at 8am, but it was 8:20 when it showed up, adding another hour to the cost ($1,500 per hour to be exact!). For some reason we had expected a private charter and were surprised when a Nepalese Army Alouette showed up. It was a tiny aircraft seating 2 aircrew and 3 passengers which was probably just as well given the size of the school yard it had to land in. The airmen were textbook top guns with their aviator specs, immaculate uniforms and narcissistic swaggers. Once the rotors were stopped, two local women casually got off with bags of luggage and groceries as as if they'd just been on the bus. They were friends of the lodge owner who had resourcefully hitched a ride (he had politely checked with us that this was OK which of course it was). I could tell poor Richard was crapping himself as he climbed inside so my own look of terror probably didn't help much. We said a brief goodbye before the door was shut and I was beckoned to stand back by the crewmen. The helicopter made a wobbly take-off, tilted it's nose downward and then headed down the valley through a narrow gap between a tree and the cliff. I was terrified just watching and fully expected never to see Richard again. I returned to the lodge where I said my goodbyes and got straight on the trail to Koto. It was an uneventful hour to Danakyu after which there was a 1 hour climb to Timang which opened up magnificent views of the Manaslu range. After another hour of slight incline through pine forest, I reached Thachok where I stopped for lunch at the Himalayan lodge. I met up with Dave and Kath, the couple we'd waded through the Marsyangdi with, and walked with them for a while before taking off to reach Koto in an hour. I stopped at the first lodge where I was greeted by a group of locals who were sat in the front garden drinking beer and raksi in celebration of the owner's son's first birthday. I joined them to eat some birthday cake and then went to call Govinda to find that Richard had arrived safely and had been taken straight to hospital where his leg was cast in plaster for a suspected fracture. I washed some clothes and had a shower and then walked up to Chame, 20 minutes further up the trail. Chame is the district headquarters in Manang and has all the same touristy stuff that Namche had in Solukumbhu (craft shops, pool bars, internet cafes etc.). I was glad I was staying in Koto. I bumped into Dave and his guide and went for some raksi and sukuti (fried dry meat) before returning to Koto to find that my hotel had been taken over by a big group of noisy Italians. I took a table in the restaurant but was recognised by a villager I'd met on the trail and was beckoned into the kitchen to drink raksi around the fire with the guides and porters. The villagers here were ethnically Tibetan and some of the friendliest people I met on the trek. An old man I'd met on the trail kept sharing his glass with me which would never happen in Hindu households. They were fascinated (or pretended to be anyway) with my Nepali chat and wanted to know all the usual facts about me. Things started to liven up when one of the porters was chucked out for being too drunk and argumentative. Then an old relative of the family who was already drunk came in for another a raksi and then fell asleep. He too was chucked out. They kept using me as an excuse as if I'd be offended by it. It was hilarious. After several glasses of raksi, the daal bhaat arrived which I ate round the fire with the Nepalis, while the Italian group ate their imitation pasta dishes out in the restaurant. This was the real Nepal and the reason I love this country so much. I went to bed at 20:15 feeling full of bhaat and a wee bit bit drunk. The Italians woke me up 1.5 hours later stomping around the wooden floors and shouting at each other from room to room. After a fitful night's sleep thanks to noisy Italians and a painfully full bladder which I had tried to ignore, I woke at 5:45 to the sound of the dreaded radio. While I have a bad habit of cursing the presence of technology up here in the Himalaya, I have used the phone a lot on this trek. I wanted to call Suzie and the kids but it was 1:30am at home so thought better of it. I should have called last night as this might have been my last chance for 4 days if there were no phones in Phu or Naar. My stomach didn't feel great this morning but at least yesterday's headache had gone. I had hoped that the headache was from dehydration or sunburn rather than from altitude as it was only 2600m here. After a couple of urgent trips to the toilet, my stomach started to feel a bit better so I laid of the Norfloxacin for the time being. At 7am the Italians came down for their breakfast which was my cue to get on the trail asap. I had some tea and a bowl of porridge around the fire and then made a couple of calls. I left the hotel at the back of 8am and had travelled a whole 20m down the village before having to stop to have my permits checked. The policeman was concerned about me going up to Naar-Phu alone so escorted me down to the Police Station to consult with the top brass. Naar-Phu is a restricted region and only guided trekking groups are supposed to be allowed in, so maybe it was now my turn to be going home early. As it turned out, the Detective Superintendent was pretty laid back and just wanted to chat over a cup of tea. It probably helped that I spoke Nepali and was exceptionally polite. On my way out, he asked me where my stick was which was a stroke of luck as I had left it back at the hotel. I ran back to find that the hotel sauji had already acquired it. He reluctantly gave it back and after collecting my rucksack from the police station, I finally got on the trail at 8:30. The valley to Naar-Phu is a formidable looking notch in the Marsyangdi valley cliffs that snakes it's way north to the Tibetan border. The trail stays close to the valley bottom for the first 5½ hours before climbing the last hour up to Meta at 3560m. Despite being enclosed in the gorge for the majority of the trek, it is a spectacular walk and some early views of Pisang Peak are afforded in the first couple of hours. There were few water sources along the trail during October so carry at least 2 litres and fill up at every opportunity. The trail started off in pine forest which was being actively managed for timber. The lumber was milled on site and the planks were immaculately stacked by the side of the path. After an hour, there was a fork in the trail with 2 equal looking paths leading in both directions. Rather than guess and waste time and energy, I waited for a group of locals I had passed earlier to catch up and show me the right way. It was the lower (right) trail. From here the trek continued in and out of the forest onto dynamite blasted cliff-side trails high above the Naar Khola where the gorge narrowed. The quality of the path was surprisingly good for this being a remote region although there was a lot more traffic going up and down than I had expected, both local and tourist. It was still a tranquil paradise compared to the circus and having a few humans around was reassuring in case anything went wrong. In fact, one of the acquaintances I met quite early on in the day would become my trekking companion for the next 2 days. About 2 hours out of Koto, the pine forest became intermixed with spruce and autumnal maple and after a further 4 hours, changed to birch and yew. Pisang Peak had been visible to the north for the first couple of hours but had been lost as the gorge had closed in. After 4½ hours the trail arrived at Dharamsala, not the Indian home to the Dalai Lama, but an ACAP camping site. By now I had met up with Yam Bahadur Gharti Magar who was a Khane Pani (drinking water) Office Technician at Chame. Coincidentally, he was from a village called Mudi where I had stayed 13 years previously while trekking the Dhaulagiri circuit. After 5.5 hours where the gorge narrows and becomes impassable, the path climbs to the east up a tributary to a large terrace on the western slope of Kang Guru. It was a hard 30 minute slog to the rim of the gorge and then another 20 minutes through fields to Meta at the top of the terrace. The village is a semi-permanent settlement used during the rainy season by Naar folk who grow crops and graze their yaks on the land around here. The houses are Tibetan style with a flat-roofed, windowless, dry stone construction and randomly attached to form a maze of narrow interconnecting pathways. Livestock are housed at ground level while the accommodation is located on the floor above. Some buildings were in a poor state of repair and had probably been abandoned. The rainy season had ended 1 month earlier and the village was deserted except for the lively lodge and the campsite on the ground below. The land was already so barren, it was hard to imagine that it could sustain any human life at all. Meta's only lodge, the Kang Guru Hotel, is the smartest looking building at the top end of the village. Yam and I checked in to our shared room and had tea in the afternoon sunshine. Afterwards, I went for a wander around to take in the sights and chillax after the long walk. It was a lofty place with impressive views in both directions up and down the Naar Khola. To the north was a barren mountain terrain typical of the Himalayan rain shadow while to the south was a magnificent view down the forested gorge I had just walked up, with Lamjung Himal as a backdrop. Below the village, on some flat ground was the campsite where 2 guided groups, both French, had set up camp. I wandered down and chatted with some of the Nepalese staff until the sun dropped behind the big lump of rock across the valley. I returned to the lodge to put on warmer clothes and set up base beside the kitchen fire, stooped beneath hanging strips of yak meat curing in the unventilated wood smoke. I was the only foreigner staying in the hotel but the place was packed full with porters, mule train drivers, locals, and government officials all moving between Phu and the Marsyangdi valley. There was only one young sauni to cater for all the demands for raksi and daal bhaat which she did remarkably well. I drank a few glasses of raksi and chatted with a couple of guys from one of the French groups who had came up for bhaat. I treated myself to a plate of the dried yak meat sukuti with my daal bhaat and retired to bed at 19:45. After a couple of hours sleep, I was awakened by one of the drunk porters banging on our room door after which I had another restless night thanks to Yam's snoring, a painfully thin mattress, a couple of heart thumping altitude anxiety moments and a nagging need to piss. I was glad when it was light and I could finally get up. Yam and I had noodle soup for breakfast and hit the trail at 7:30. It was a flat 1¼ hours walk through juniper and thorn scrub to the next seasonal settlement, Junum. The view back to Pisang Peak with the long, steep path across it's lower slopes was impressive from here. An hour later we reached Chyaka, another abandoned seasonal settlement high above the Phu Khola. After Chyaka where the trail forks, we took the upper (right) path which climbed steeply to the top of a small moraine ridge (the lower path used by mule trains is less steep but longer). After descending the ridge, the path forked again. Yam directed us to go right but this led to a stream which was too icy to cross. We had to back-track to the fork and take the lower path to the bridge. It was a hard 15 minute climb up the next moraine ridge from which you descend into Kyang. We stopped here with a couple of porters to eat snacks and rest. From Chyaka it had taken 45 minutes to reach Kyang and according to the ACAP sign board here, the altitude was 3840m. Yam was proud to inform me that he had installed the drinking water taps here. I think he was a bit embarrassed when the water came out brown. We left Kyang at 11:15 and climbed up to a cliff side trail which then headed back down to the river. The path followed the river, more or less, for 1½ hours, occasionally climbing up and down steep scree. At the big rock pillar we climbed a steep trail for 10 minutes to a gate. I could sense that we were close to Phu by the increased frequency of chortens and signs of cultivation. From the gate it was another ½ hour to Phu on an easy trail. Phu is an amazing village of Tibetan style flat-roofed stone houses built up against each other over a small hill at 4100m. The lack of electricity cables gave the village an authentic medieval look and if it weren't for the glass windows and a few water heating solar panels giving away the arrival of some modernity, it looked as if it were unchanged in over 500 years. The valley is wider here and there are snowy mountains visible in 3 directions with Kang Guru dominating in the south, Himlung Himal in the east and the mass of mountains which border Tibet in the north. It was a truly breath taking place. The only lodge in the village was shut so we went to a house where Yam knew the owners and had noodle soup and salted Tibetan tea. Previous experiences of rancid yak butter had put me off Tibetan tea but this time the butter was fresh so I had 5 cups! I enquired about a phone and was surprised to learn that there was a working satellite phone in the village. Unfortunately, like the lodge, this was also shut. After tea, Yam and I left our bags at the house and went for a wander up to the gompa which was across the river and up the opposite hill. The views from the gompa were even more spectacular than from Phu. We looked around the prayer room and left a donation before returning to the village. The lodge still hadn't opened so we went back to the house to sit around the fire as the sun had now dropped behind the mountains making it suddenly very cold. The rest of the Water Office staff arrived at 17:00 but still no lodge owner or telecoms office staff had showed up. At 17:30, the lodge didi arrived home from the fields and we moved our bags to the room and drank some more butter tea. At about 18:00, someone shouted across to tell us that the phone office bahini was back so I went up to make a call home. The phone "office" was a small, dark store room with a phone on a table. I called to Govinda to get an update on Richard and then called home to Suzie. It was great to talk with her although we spent most of the call talking about Richard and I didn't get to hear what the kids were doing. The cost was surprisingly cheap for a sat phone at 100 Rs per minute although the reception wasn't so great. We returned to the hotel for a beer and sukuti which was like bits of fried leather but tasty enough bar a couple of rotten bits. After eating the daal bhaat with potato and cabbage curry, there was noting left to do so we went to bed. I think I must have been snoring loudly as I woke up with a jolt. Perhaps Yam had shouted at me. I had my earplugs in so would have been none the wiser. After that I lay fighting the need for a piss and eventually got up into the cold, clear night to go. The sky was a mass of brilliant white stars - you would never know that there were so many from what we see here in the UK. After the pee, I had a much better night's sleep with no symptoms of AMS at all. I got up at 6:10 for an urgent trip to the smelly drop toilet and returned to the kitchen for an omelette breakfast. I settled up my bill which was more expensive than I had expected but then the beer alone was 350 Rs - inflated by the extra porterage charge. Don't get me wrong, I didn't grudge the cost; it was still well affordable by western standards. Life is tough this deep into the mountains and the limited income from visitors is a much needed boost to the economy. All tourists (bar me) come here on camping treks so lodges and teahouses rely on Nepalese custom for most of their earnings. I would like to have spent another night at Phu and explored the valley up to the Himlung Base Camp, but I was on a mission to meet up with Richard so didn't hang about longer. Having said my farewells to Yam and the didi, I left the lodge at 7:25 and started the walk back down the trail alone. Now that I knew the way (not that you can go wrong much), I wasn't worried. That said, I did miss Yam today. Although we didn't really chat much on the way up, he had been good company and it had been reassuring that he was there in case something had gone wrong. The main risk of trekking alone for me was having no one to seek help if I fell off a high trail and was injured. There was enough traffic on the trail to ensure someone would find me and raise the alarm if I sprained an ankle or something similar, but if I miraculously survived a fall into the gorge, it would be slow, lonely death. I was walking quickly today and reach Kyang in 1¾ hours, half an hour quicker than on the way up. This time I had gravity on my side and no companion to wait for. I also wasn't stopping to take photographs as the light was still too low and I had taken all the ones I needed on the way up. After a 15 minute rest at Kyang, I set off at 9:25 to tackle the 2 moraine ridges which were just as tough to climb the second time round. Ten minutes on from the wooden bridge at the base of the second ridge, the path forked. This was were the new mule trail joined the main trekking trail at it's northern end. Needless to say, I took the shorter, steeper trail to the left and was in Chyaka by 10:10, 45 minutes from Kyang. Chyaka looked like it was a permanent settlement once; one building looked like it might even have been a school. Yam had told me on the way up that the terraced fields around the village used to be khet (irrigated) until the water dried up. After a 10 minute rest, I left for Junum and arrived 20 minutes later at 10:40. From Junum, it was a 45 minute walk to the fork in the path where I turned right for the bridge to Naar. This route is considerably quicker than continuing on to the sign-posted route nearer to Meta. Why ACAP didn't sign-post this closer trail is a mystery. Without a guide it would be pretty hard to tell it apart from a grazing track. Luckily for me, Yam had pointed it out to me on the way up. On the way to the bridge, I gave most of my last bottle of water away to some thirsty porters and hoped I was going to find more before the hard climb up to Naar. From the fork, it was a 20 minute descent down steep moraine to the bridge across the Phu Khola. There were actually 2 bridges here; a rickety traditional wooden bridge and a new galvanised steel suspension bridge, both built side by side where the gorge narrows to only 10-15m wide. Naturally I crossed on the suspension bridge although this was enough to give me the fear when I looked down to the river at least 50m below. There was no water at the campsite up from the bridge so I climbed for 10 minutes and took the left path to the where a new gompa was being constructed and I refilled my bottles there. I then climbed straight up for 10 minutes to rejoin the main path. After 30 minutes of hard ascent, I reached a gate, just after which there was a goTh and a running tap! I had been misinformed that there was no water on the path up to Naar. This would have saved me a half hour detour had I received better information! The weather wasn't great today and clouds had been building up since 10:00 and were now mostly obscuring the views of Pisang Peak and Kang Guru. There was a strong. cold wind too. Above the hut, a fork in the path provided 2 options to reach Naar; the left was another mule/yak train trail that contoured gently around the hillside, where as the right was direct but steep. On the steep trail it took 45 minutes to reach the first yak pastures of Naar and a high wall with a locked gate across the path. Fortunately there was a style over the wall. The herders were starting to drive the livestock back to the village so I move quickly to get ahead of them. It was another 25 minutes of fairly flat walking to reach the village of Naar. Naar, like Phu, is a hotchpotch of medieval flat roofed houses but this time built on a south facing slope rather than over a hill. It was an amazing sight as I approached it. I found the Shanti Hotel at the top of the village and checked in to a pokey room above the kitchen. After a bowl of noodle soup I went for a wander around to take photographs. All around the village on the open flat ground, the villagers were threshing wheat the old fashioned way with long-handled beaters. Although the fields are family owned, threshing seemed to be a communal activity. Each team consisted of 2 opposing lines of 6 men per line, beating the wheat ears laid out on the ground between them. One line would swing and beat, followed by the other in rhythmic succession. It was fascinating to watch. I returned to the hotel as it got dark and settled into the kitchen and had daal bhaat and maasu early at 18:30. After dinner I retired to my room which had now turned into a smokehouse thanks to the unventilated smoke from the kitchen fire below. I considered asking for another room but couldn't be bothered to move my stuff so decided to risk asphyxiation and stay put. I was hoping to be up at dawn and be on the trail by 6:30 but my mobile phone battery had now completely run out so I had no alarm to wake me. There was a 20cm square hole cut into the wooden partition by the door so I hoped that would let in enough light to wake me naturally. Like Phu, there were no chickens or dogs here that I could see so I wasn't going to get a wake up call from them. It was 7pm when I climbed in my sleeping bag. Outside in the freezing dark there was still a team of villagers beating wheat under solar-powered flood lights. Unable to sleep, I lay thinking about the day ahead. It had been very cloudy all afternoon but was clearing now and I hoped it would stay clear until I crossed the Kang La at least. The Kang La is a high altitude pass of 5306m according to my map and I was slightly anxious about making the crossing by myself. I'd spoken to a couple of groups staying in the village and none were crossing the next day. Altitude sickness was less of a concern as as I was well acclimatised here at 4110m, but an injury or navigational blunder could be fatal. I only had a couple of hard boiled eggs and a few packets of biscuits and nuts for the journey so wasn't equipped long periods of self-sufficiency. I was hoping to descend as far as Bhraka which would make it a long day's hike although I wasn't looking forward to joining the Annapurna circus again. It had been serenely peaceful up in the Naar-Phu valley and I wished I'd had more time to stick around. At about 20:00 the threshing stopped and by 21:00 the activity in the kitchen ceased and the fire put out. After a few hours kip I woke up for the obligatory Diamox piss and then couldn't get back to sleep until after 2:00. At 3:30 the threshing started again taking advantage of the moonlight. I stuck the ear plugs in and dozed until 5:30. I left the lodge dead on 6:00, descended to the main street through Naar, turned right (west) and through the village to the big gate. After another gate and then a row of chortens, the ACAP sign directs you right onto a path to Kang La. After a short climb to 3 chortens and over the water tank overflow channel, I joined the single obvious path that heads west along the right hand side of a moraine ridge. A snow covered mountain, Chulu Far East (6038m) I think, provides an obvious reference point to aim for at the valley head. After 1.5 hours the path descended to the valley floor and a further 15 minutes further arrived at Kang La Phedi with a small hut and tiny camping ground. A couple of staff from one of the French groups had already arrived to claim the site leaving no room for the other groups still to come. Why groups stop so soon out of Naar doesn't make sense to me, especially as there is nothing to do here. This would have been way too short a day for my liking. The water pipe was frozen at the campsite and I'd passed no other sources since Naar so I excavated a pit in a dry stream 2 minutes on and filled my water bottles from there. As it turned out this was wasted effort as a little further on there were 2 running streams. Bear Grylls would have been impressed at least! At 8:10, I reached the base of the steep slope from where I climbed up a scree path to a cairn in 10 minutes and then contoured around a scree slope onto moraine to climb gently to a stream in another 35 minutes. This was the last water source until Nawal, the other side of the Kang La so it's essential to fill up here. After a 15 minute rest to eat my half hard boiled egg and some biscuits, I hit the trail again at 9:00. The path crossed the stream and climbed steeply around the left side of a buttress. After 10 minutes, the path turned left (south) to start the steep climb up the ridge to the pass. From here the ground was covered in about 30cm of snow although a path had been trodden through it making the walking slightly less strenuous. It was still a hard slog up to the pass with frequent stops needed to catch my breath. Back to the east, the view of the beautiful peak of Kang Guru and Manaslu were a welcome distraction from the exertion. Higher up the path was not exposed but the snow was crusty enough to get a good grip without being dangerously icy. Without a path or footprints to follow, it would be difficult to navigate to the pass as it isn't visible until the last half hour of the climb. After 1 hour and 20 minutes from the stream (4 hours 20 minutes from Naar), I reached the Kang La. Despite intermittent clouds, the view over the pass was magnificent with Annapurna II and IV towering above the forested Marsyangdi river valley stretched out below. The pass itself is a small notch where the knife-edged ridge meets a sheer rock wall on the south side. There was just enough room for the tall chorten and a few cairns that have been built on top of it. It was a lofty and peaceful place with only the sound of the obligatory Tibetan prayer flags flapping in the gentle wind to break the silence. I didn't have any symptoms of altitude sickness at all and I wondered what my "sats" (blood oxygen saturation) were. Sats is a term my wife, an oncology nurse, uses which made me think of her and the kids back at home. I spent half an hour on the pass contemplating life, taking photos and eating the rest of my food before setting off to rejoin the circus. The slope down the south side of the pass was brutally steep and was fortunately only snow covered for the first 20m or so. After the snow though, the descent was down loose scree which could be heard slipping all around. I didn't hang about and set off at a quick pace. A little further down, Annapurna III, Gangapurna and Annapurna I came into view in the west and further down still the full Annapurna range from Lamjung in the east to Tilicho Peak in the west could be seen. Even Dhaulagiri I was visible at the western extent of the panorama. It was an awe inspiring view. After 30 minutes of descent, I took the right path where it forked and then right again after a further 10 minutes to avoid a longer mule trail. Five minutes further on I left the path to continue on down the crest of a moraine ridge to avoid the switchbacks. The path dropped off the ridge down a dry river bed to reach a corrugated steel roofed goTh, 1 hour from the pass. After another 5 minutes the path descended to a mani wall to rejoin the main trail. At another fork 25 minutes further on, I went right again to avoid another longer mule trail which took me down a steep descent past a line of prayer flags into Nawal. I arrived at about 1pm and stopped for daal bhaat at the first hotel and filled my water bottles for the first time in 4 hours. Nawal is a traditional Tibetanesque village which is one of 6 villages on the upper (and more culturally and scenically interesting) of 2 alternative trails between Lower Pisang and Mugje. In comparison, the lower trail takes the valley floor through artificial villages and has inferior views of the mountains. I met several people on guided trekking trips around the Annapurna circus who were taken on the lower trail by their guides which is a crying shame and must be due to either laziness or ignorance of the guide. If you are trekking the Annapurna circuit only, you should insist on being taken via this upper Manang route. I set off again at about 13:50 and took the top path out of the village (instead of the lower tourist route) which descended to a deserted village (marked Bhardoche on the map) and a large, new-looking gompa built in 2001. The path descended though pine and cypress forest to Julu, a small traditional agricultural village untainted by the tourist boom. On the trail I met a red fox which was the only wild mammal I saw on the whole trek. After crossing the river on a wooden bridge, the path rejoined the main Ngawal to Bhraka trail, about 1 hour 10 minutes from Ngawal. I stopped at the Happy Tea Shop for a quick brew and rest, then continued for a final hour to Bhraka. I stayed at the Ice Lake Hotel which was nice enough and provided a bucket of hot water for my first full wash in 4 days. I called Govinda to find out Richard had flown home already so called my friend Raghu in Baglung to say I'd be staying a few days but found out he was in Kathmandu for the next 5 days! In the hotel I met 2 Khane Pani technicians who worked with Yam (my companion on the Phu walk). I took their photo and promised to send them copies which I never did. I got a lot of requests like this and rather than being honest, I adopted the Nepali tactic of saying what they wanted to hear and agreeing. Bad really. I woke up at 4am with a churning stomach and took a norfloxacin tablet in the hope that it would go away. It didn't and eventually got up to visit the toilet which turned out not to be as bad as I expected. I finally got up at 6:30 and had cooked museli for breakfast. I hadn't expected it to be cooked and it was as horrible as you'd imagine it to be. I hit the trail at 8:15 and soon arrived at Manang town where the path to Tilicho Lake branches off from the main trail. The original plan before Richard's accident was to spend a night at the new lodge at Tilicho Base Camp and then another night camping at the lake before crossing into the Kali Gandaki valley. While I thought it could have been possible to have crossed from Tilicho Base Camp to Kaisang (first village on the Jomosom side) in a single long day, it would have been too risky to have done so alone. I reluctantly listened to common sense and decided I should go over the Thorung La instead. I reached Ledar in a speedy 3¼ hours where I stopped for egg noodle soup before getting back on the trail at midday. After 1 hour 40 minutes of fast trekking I reached Thorung Phedi to find that all the lodges were full. I was kind of glad as it was a soulless place full of bored looking trekkers milling around killing time before their pre-dawn pass crossing. After a brief rest to talk to some of the guides I'd meet in the first few days of the trek, I continued on to Thorung High Camp which at 4925m was another 475m higher than Thorung Phedi and only 491m from the pass. It took only 35 minutes to climb the 475m and I thought about continuing on over the pass but I was too tired and it looked like a nice teahouse for it's extreme location. I took a twin room for Rs 280 rather than risk the dormitory and after dumping my rucksack, went for a wander up a small peak to take some photos. I returned to the lodge restaurant feeling pretty ropey with an altitude headache so took some diamox and ibuprofen. I started thinking about the day ahead and decided that I would cancel the flight from Jomosom to Pokhara, which wasn't due to depart for several more days, and would instead do the 2 day jeep and walk combination down the Kali Gandaki to get to Baglung. I wasn't really enjoying being back on the Annapurna circuit again after my few days of solitude in the Naar-Phu valley. It was a pity I hadn't known about Richard's departure sooner as I could have stayed there longer but now that I was out I wanted to get to Baglung as quickly as possible to be with Raghu in time for the Tihar (Diwali) festival. I felt pretty low and was missing Suzie and the girls terribly so decided to be sociable to take my mind off it. I joined a group of French trekkers and a Polish English teacher for a chat and to warm my feet on the under-table electric heater while I waited for my dinner to arrive. I arranged for a 5am wake up call from the Pole so I could be on the trail by 6am at the latest. After a very tasty egg & vegetable fried rice, I retired to my room at 19:45. It was freezing by now so slipped into my thermal leggings, 2 fleece tops, hat, gloves and socks and snuggled into my 4 season down sleeping bag. I was glad I had made the effort to come up here rather than sleep on a floor in grotty Phedi. At over 4900m, it's a cold desolate place to build a lodge but it's well constructed and very well managed. I slept fine until midnight and then woke up with a headache and urgent need to piss. After a quick foray into the snowy night, I struggled to get back to sleep and drifted in an out of altitude dream weirdness until about 4:00 when the first groups started to trudge past the window on their way to the pass. Why anyone lets their guide persuade them to trek up to the pass in the freezing darkness is a mystery to me. There's nothing to see on the way up except the small illuminated circle of ground in front of you and when you get there, the light will be too poor to take any decent photos. Furthermore, it really isn't that great a view from the Thorung La and certainly not worth sacrificing sleep and breakfast for. My advice is to stay in bed and save your head torch batteries. I left the lodge at 6:05 after a breakfast of pancake and black tea. My total bill was 880 Rs which was pretty steep for me but this was the remotest lodge on the circus I guess. I started off quickly and soon burned past the straggling groups feeling smug that I'd had an extra hour in bed and a warm breakfast. It was breathless work so I slowed to a more steady pace but still reached the pass by 7:40, 95 minutes from High Camp. The sun had risen over the surrounding hills by the time I'd arrived which made the place seem a bit more welcoming but the crowds of trekkers, a teashop and a tacky signboard congratulating us for the (sic) success trashed any possible ambience. Perhaps I'm a mountain snob or was just spoiled by the quality of the peaks earlier in the trek, but the view over the pass into the Kali Gandaki valley isn't much to get excited about either. The only mountain of note, Dhaulagiri I, isn't visible until you've descended a few minutes and even then it's the less impressive north face you see from here. After a 10 minute snack break away from the madding crowds, I descended the moraine slope to the tea shops at it's terminus in 1 hour 35 minutes. The first hour wasn't too strenuous but after that the slope became knee achingly steep. From the teashops, it was a further 45 minutes of more gentle descent to reach Muktinath. I never recalled Muktinath as being a picturesque place from my previous visits in 1995 and 2001 but I wasn't prepared for it to be as grim as it was now. A hideous concrete gate had been built to greet visitors' arrival from the Thorung La trail and an even more ugly concrete wall topped with barbed wire had been built around the sacred site. A load of new concrete houses had cropped up too. The arrival of the motorable road had clearly not benefited the local environment. Eager to move on, I headed straight for the jeep park at the far end of town to catch a pricy 500 Rs ride to Jomosom (yes I am a hypocrite, I know). Unfortunately the next jeep was a long way from being full so I ordered daal bhaat to kill some time. Over an hour later, the jeep was crammed with12 of us inside and 1 on the roof with the bags, and at 12:15, it finally rolled out of town. We were making good progress initially and I even allowed myself to hope that I might get to Baglung that same day. Then a puncture hit, and of course we didn't have a spare wheel so had to wait for the another jeep to come along that did have one of the same size. Surprisingly we didn't have to wait long and after a quick change, were back on the trail and in Jomosom by 13:45. Much of the jeep track is built over the trekking trail so that poor trekkers trying to enjoy their tranquil Himalayan hiking holiday get plunged into clouds of dust each time a vehicle goes by. Horrible. To catch the next jeep as far as Ghasa, I had to walk through Jomoson to the jeep park on the south side of town. While it was an inconvenience to have to walk this half mile, it certainly benefited the town environment by keeping it free of the dust clouds and fumes. Despite the high cost (600 Rs this time), the jeep filled up quickly and we were on our way by 14:15 and in Ghasa by 16:55. Again, much of the track had doubled as the trekking trail and had made a hellish mess of what was once a beautiful trekking route. There were some sections still unspoiled, most notably through Marpha and the trail from Kobang to Kalopani. Still, I was glad I'd walked this trail before the march of progress had ruined it once and for all. I debated whether to stay the night in Ghasa but was persuaded by some Kathmandu students I'd teamed up with to press on. A landslide below Ghasa had taken out the road so we had to walk for 40 minutes to the next road head at Kabre. After a half hour wait for a jeep that was never going to come, we walked on in twilight to the next village of Titar where a small bus was about to leave. It was rammed so I sat on the roof dodging low branches and fireflies for the first hour until my backside could take the bumps no more. Fortunately, the number of passengers inside the bus had thinned out and I had a seat for the remaining 2¼ hours to Beni. Even in the dark I could tell the road was in poor condition, which was frequently evidenced by the sideways sliding and wheel spinning of the struggling bus. It was just as well I couldn't see where the precipices were. It was 21:30 when the bus finally revved it's way into a very closed up Beni. After no response from the first hotel, the second was more accommodating and took everyone left on the bus in. Of course they didn't have enough rooms for everyone so I ended up sharing a triple room with the 4 students. I was so shattered I could I gone to bed there and then but had to wait until 23:30 for the daal bhaat to arrive. Luckily the students shared the double bed leaving the single for me. It was a bad night though and I'd wished I'd stayed in Ghasa after all. Still, it had been an epic day and I was only 2 hours from Baglung where I now had 5 days to hang out with old friends.